Dyna Glo Grill Reviews: A Must-Read for Buying Guides - EHOMEPICK "Just Another Home-Outdoor-Garden Blog"
Dyna Glo is a Chicago, Illinois-based company popularly known for their versatility and high-quality products, which include gas and charcoal grills, smokers, grill accessories, construction and industrial heaters, recreational heaters, vent-free wall heaters, and indoor kerosene heaters. In this Dyna Glo Grill Reviews post, we are going to discuss in detail some of their best-rated grills, including a summary of their key features, pros, and cons. To add, we have rounded up all the features that you should look out for when choosing a grill. As barbecue season is coming up, we are hoping that you will be able to choose the right grill for you and your family’s enjoyment. The 4-burner stainless propane grill by Dyna Glo will be a great addition to your patio with its durable construction and high-performance cooking system. Dyna Glo already has a good reputation in terms of long-lasting products and this grill is no exception. With this grill, you will be able to achieve flavorful and excellently grilled food. What makes this Dyna Glo grill one of the best is that its power cooking system comes with a porcelain enameled firebox, in which the 4 stainless steel burners are housed. It is also interesting to know that the burners can deliver a combined total of 40,000 BTUs. This feature would be a great help to ensure that you will be provided fast, consistent, and high heat when grilling. This Dyna Glo grill has a sleek design, which includes a cabinet assembly that has double wall doors and 4 multi-directional casters, allowing you to easily transport the grill. It is also very easy to use, with its one-button operation. It is a relief that you are only minutes away from enjoying juicy grilled chicken, steaks, and burgers. Each burner can deliver 10,000 BTUs, including a side burner with 12,000 BTUs capacity. It features electronic ignition, as well as infinite setting control valves. Its cooking space totals to 646 square inches. You can protect the grill from the rain through its custom fit premium cover, which is sold separately. It features a storage cart that makes it easy to transport. It comes with an integrated temperature gauge for precise grill zone temperature measurement. It will be able to provide accurate temperature to ensure even cooking. It is very easy to use, clean, and maintain. It has a heavy-duty and durable surface. It offers flexible cooking flexibility. The propane tank pull-out tray is sold separately. This grill is one of the most expensive in their line of products. The Dyna Glo 5-burner bronze propane grill is another great grill offered by the brand, now delivering a combined total of 50,000 BTUs, along with a stainless steel 12,000-BTU side burner. It is very much like the previous Dyna Glo product with only a few upgrades. If you are cooking for a larger group, this is the one you should get. 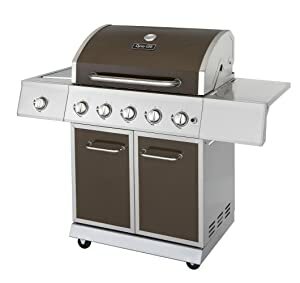 Like the 4-burner stainless propane grill, this 5-burner bronze propane grill has a durable lid construction, which ensures that heat is retained and cooking efficiency is improved. 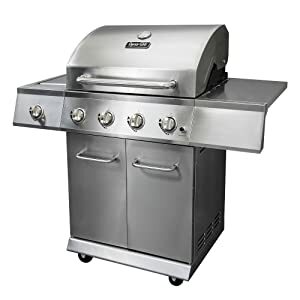 It also has the cabinet assembly with 4 multi-directional caster that aids in easy relocation of the grill, as well as the one-button operation, making the grill very easy to use. A great thing about Dyna Glo grills is that they have a built-in thermometer that helps in precise temperature control and an easy to comprehend gauge to help you know that the meat has perfectly cooked. Replacing your propane tank has also never been this easy because of the sliding tank tray in the front portion of the grill. What makes this grill a great buy is the heavy-duty and stainless-steel grates and finish, which is ideal for locking in your meat’s natural juices. It features infinite setting control valves. It also comes with an easy-push Electro Pulse Ignition. It can deliver a combined total of 62,000 BTUs for improved cooking efficiency. It comes with cooking grates, a warming rack, and heat tents. It also is equipped with integrated temperature gauge for temperature accuracy. You can enjoy burgers, steaks, and chicken in only a few minutes. It has burnished bronze metallic and stainless steel for durability. Replacing your propane tank is easy with the pull-out tray. The lid will be able to lock in your food’s natural juices. The propane tank tray is sold separately. It may generate rust after a year of regular use. Another great offering by Dyna Glo is the Dual Zone charcoal grill. Nothing compares to the flavor of freshly cooked meat from a charcoal grill, which is why the brand has introduced a grill that can consistently provide juiciness and taste every time you use it. As the name suggests, it uses charcoal, unlike the first two products on this review, which uses propane. The Dyna Glo Dual Zone charcoal grill is loaded with outstanding features that makes it one the best additions to your patio. It features the same cast iron grates that ensures heat transfer and searing across its 816 square inches of cooking area. It is also labeled “dual zone” because of the convenience of having a removable steel divider for temperature customization. This feature will be helpful if you are cooking food that require different temperatures. This charcoal grill also is equipped with an ash pan that will not be needing as much maintenance as the other grills. It also has casters and wheels for easy mobility and transfer. Like the previous grills, this one also has the built-in stainless thermometer that ensures the temperature is accurate, as well as the easy to read gauge that will help you achieve excellently cooked meat. Other great features include the dual steel doors and the grates slide that allow easy access to the charcoal. It also comes with a removable pan that collects ash and grease for easy disposal. It features 2 charcoal adjustment tray systems that lets you control the heat effectively. Just the previous products, it has the cooking grates that sears and heats the food consistently. It is equipped with a divider, whose temperatures can be controlled separately. It has an 816-square inch cooking space, allowing you to grill as much food at the same time. It comes with a set of wheels and caster that allow easy transport and transfer. It does not require hours of maintenance. It can cook as much food as possible with its large cooking space. Collecting ash and grease is easy. The cover is sold separately. The charcoal pans may be too wide, causing charcoal to fall through. 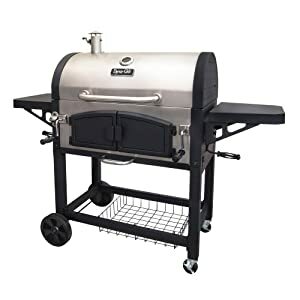 The first gas grill on this list is the Dyna Glo Gas Grill, which houses 3 stainless steel burners that delivers a combined total of 36,000 BTUs. This feature, along with the 503 square inches of cooking space, ensures high and consistent heat for achieving an even and perfectly cooked food. It also has a compact design, which makes it ideal for smaller patios. Like the previous grills on this review, this gas grill has the signature durable lid that can retain heat and stability. It also incorporates the enclosed cabinet assembly and the multi-directional casters for easy mobility. It is also very easy and simple to use, with its one-button operation. With this, you are only steps away from enjoying freshly cooked steaks, burgers, and chicken. What makes this gas grill a standout is that it come with powder-coated steel side tables, which can be used for resting containers and plates while you are grilling. These collapsible side tables also allow you to free up some space when you are not using the grill. It also has a porcelain-enameled finish that ensures effective heat transfer while cooking. It comes with a chrome-plated control valves, as well as an Electro-Pulse Ignition that allows quick startup. It has collapsible side tables, which can be used for resting containers and plates. It is equipped with a built-in stainless thermometer for accurate temperature control. It can deliver a combined total of 36,000 BTUs. It has a high-gloss black finish and compact design, perfect for small patios. It is very easy to assemble, clean, and maintain. Collapsible features allow you to save more space. It is durable, with its stainless steel commercial grade burners. It offers flexibility due to the control valve options. When the side tables are down, you would not find a place to hang your tools. There might be a hotspot but still cooks the food evenly. Another outstanding charcoal grill offered by Dyna Glo is the DGN576DNC-D Premium Charcoal Grill. 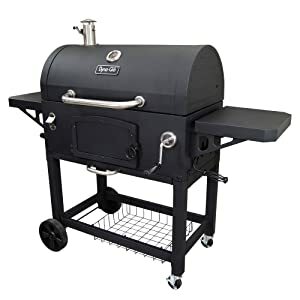 It almost has the same features as the previous charcoal grill but the difference is that it does not have a dual zone grill space. With its price, however, it sure is still a great buy if you are only cooking for a small group of people. This charcoal grill has a total cooking space of 816 square inches and it comes with a charcoal tray adjustment crank that lets you customize the temperature settings. Ash and grease is also very easy to dispose because of the removable ash pan. 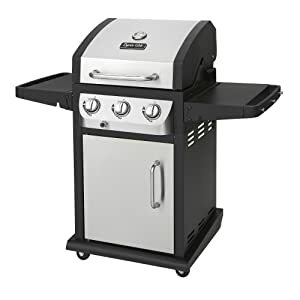 It is also interesting that the grill has a convenient stainless-steel bottle opener, which would mean that you no longer must go back inside to grab it. Like all the grills presented on this review, it has a built-in thermometer that allows accurate temperature control. In addition, its steel door allows convenient access to replace the charcoal. It also features sliding side dampers that are designed to maximize the air flow. You can accurately control the heat with its charcoal basket adjustment tray system. It has porcelain-enameled grates that ensures heat retention. It has an 816-square inch cooking space. It comes with resin wheels and casters that allow easy mobility. It is easy to clean and maintain, with its steel door found at the front portion of the grill. Access to charcoal is easy, with the cast iron and steel door. Maintaining the accurate heat is easy with the built-in thermometer. It is also very easy to transfer and transport. Wood can also be used instead of charcoal. The custom fit Dyna Glo cover is sold separately. The ash tray may be too shallow for some. When buying a Dyna Glo grill, taking into consideration the features that you will be able to fully utilize will help you in determining which one to buy. For instance, a side burner will be able to help you cook your food as evenly as possible. Having to pick a grill that has that feature will be an advantage for you. Knowing which features you will most benefit from will help you narrow down your choices into choosing the best one. You might also find it useful if you have side tables to place your container and plates while you are grilling. To add, features such as the built-in thermometer and the control valves will also be vital, as we all want our food to be cooked at a fast and consistent heat. With these features, you will feel relieved that you no longer should worry about burning or overcooking food, as long as you have set the accurate temperature. Mobility has never been an issue with Dyna Glo grills presented in the above reviews. If you notice, all of them have wheels that allow easy transfer and relocation. You never should worry about carrying it whole as you transfer it from one place to another. The cooking area is also an important factor to consider, especially if you are cooking for a large group of people. A small one may be appropriate for you if you are only cooking for you and your family. However, if you enjoy having a barbecue with your friends and relatives every weekend, a bigger grill will be able to cook food with less waiting time. British Thermal Unit or BTU, is the measure of energy exerted by each burner. In this review, you have come across a couple of grills that has different BTUs. To determine which Dyna Glo grill to buy, you must also take into consideration the number of people you are serving. Grills with 4 burners usually have 40,000 BTUs, enough for cooking for a small group of people. We all know that Dyna Glo is indeed one of the best manufacturers of grills in the world. You might notice that almost all the grills presented in the reviews have cast iron cooking grates with porcelain enamel finish. This feature ensures that the heat is evenly distributed on the surface of the grill. To add, they also ensure that the food prevents from sticking on the surface. Another thing to consider is the double-layered hood that will be able to retain the heat whenever it is closed. You do not have to worry about this, as all the products presented in the reviews already have this feature. Your Dyna Glo grill having a compact design is especially be beneficial for homeowners who have small patios. It is a relief that you no longer should worry about ease of use, as all the products presented above have a convenient one-button operation. These models will make it easy for you to look after what you are currently cooking on the grill. They all have accurate temperature controls that also ensure fast and efficient cooking. Dyna Glo grills are very easy to assemble on your own; however, it is advisable that you set it up with another person to help you. If you would notice, the instructions manual is very easy to understand and follow. This is very important, as the effectiveness of the grill solely depends on how you installed it, whether correctly or not. It is advisable that you clean your Dyna Glo grill after every use. Maintenance, on the other hand, can be done after every few months. This has also never been an issue as all grills presented in the above reviews all have easy disposal trays that allows you to clean the grill up with ease. You will also never have to take so much time cleaning it as the removable components have made it very easy for you. Price has always been a determining factor when choosing a Dyna Glo grill. You might find it a tedious and a confusing task to choose which one to buy when all of them have different prices on the market. Here’s a trick, you might want to consider the features first before you decide if you are willing to pay the price for something that will be greatly beneficial for you. This way, you can narrow down your choices into choosing the grill that has the best value for you. Obviously, a cheaper Dyna Glo grill offers lesser features. However, certain factors must be considered, especially if you are contemplating if you really need the said features or not. If you are only cooking for a small group of people, why not buy the cheapest one? You might also consider it as having saved a lot of money, as you do not really need a large cooking space. In this post, we have discussed 3 types of ignitions: gas, propane, and charcoal. Knowing which type of ignition you prefer will save you a lot of time thinking about what model to buy. With this, you might also want to consider the overall maintenance of the grill. As the name suggests, a charcoal grill might be the most difficult to clean. However, you do not need to worry about this issue, as Dyna Glo have removable parts that allow easy cleanup and maintenance. Now that we have discussed in detail the best Dyna Glo Grill Reviews, we are confident that you will be able to utilize them to determine which grill is right for you. Through this guide, you might have learned that it is not always about the price, it’s also about the features. Knowing which feature is advantageous for you is the first step in choosing the best Dyna Glo grill.